Writers write books. And in this age of indie and self-publishing sometimes we design covers for them. Good covers. Bad covers. Covers that attract readers, or repel them. The truth is, not all writers are good cover designers or have the artistic, computer, or technological skill to pull off a good cover. Sometimes we need to hire someone, but that can be expensive, and where and how does one find a good cover designer? I am pleased to say, I recently “met” book cover designer Kura Carpenter through SpecFicNZ, the national speculative fiction writers organization I started in New Zealand while I lived there. Kura is from Dunedin, New Zealand and has designed for authors all over the world, including a recent cover for Steam Press for the novel ‘Tropic of Skorpeo’ by author Michael Morrissey to be released later this year. Kura kindly agreed to let me interview her about cover design, so here it is. I asked and she answered. All you have to do it enjoy! Kura, how did you get into book cover design? A couple of years ago my friend, Justin Elliot, asked me to create the cover for his YA Fantasy adventure, A Dark Future. I really enjoyed it, but I pretty much wrote it off as a one-time opportunity. Then in 2011 I met Peter Jenks who was about to release a non-fiction guide as an ebook, and I increasingly became aware that ebooks were really taking off and that publishing was changing and I could design for anyone, anywhere. What is your favorite book cover of all times? I don’t have a single favorite cover, but I do have a favorite design era. I love the Art Nouveau & Arts and Crafts influenced covers of the late 1800s. Will Bradley’s cover for ‘In Russet and Silver’ published in 1894 is a good example. What is the hardest genre to design a cover for? The easiest? As I’m primarily a photo manipulator, I find the hardest is Historicals because sourcing photos of models in historically-accurate clothes can be challenging. I find the easiest are those with a strong emotional content, so for example romance and horror. What is your favorite kind of book to design a cover for? I enjoy doing thrillers most because I like creating a graphic that will tell its own story, and thinking in terms of visual cues as to the tone of the book is great fun. I also enjoy doing sci-fi because I get a chance to flex my Photoshop muscles and create special effects >> Blue lightning, anyone? On average, how long does it take you to design a cover? The length depends on the genre and the number of base photos required to build-up the graphic. A sci-fi/fantasy cover will usually be heavy on props and special effects and therefore they take longer. For example the fantasy cover I created for James E Thomas Reed Butler’s Story’ required ten images, whereas the non-fiction ‘Girls and Dating’ by PM Jenks only required one. But in terms of hours, I’d say on average 8 to 12 hours. Authors are often surprised at how little say they have over their book cover with a traditional publisher. How hands-on is the process if they commission one with you? That’s entirely up to the author. I personally like a collaborative effort, and so I encourage the author to have a lot of input. It’s important to me to understand the author’s taste and style, after all I’m creating a cover that needs to fit their individual brand. I think it’s very important to project the right tone, and I think people sometimes forget that fonts also have a tone. To demonstrate this I’ve created a simple graphic where I’ve reversed the normally associated conventions with two fonts. I feel genre clues are extremely important, as they are all about setting a tone. Any adult having grown up as a book lover will have developed an unconscious but very sophisticated ability to interpret and value a cover design through visual cues and symbols. So for me, the key to good covers begins with understanding the market. What a particular audience wants and expects to see, and what those things mean. For example, imagine a man standing in a forest a night. What genre is that? Not enough info? Ok then, he wears a cloak and holds a lantern… Are you thinking Historical about now? But what if I add, the lantern is illuminated by captured Fairies…? I saw a recent discussion on-line about the use of gender neutral covers for YA versus gender specific covers (covers that feature a guy protagonist, or, more often, a girl protagonist). Books like Divergent, Legend, and Hunger Games had very gender neutral covers. What’s your opinion on the roll gender plays in cover design and appeal? To me this question precedes the design process, it’s really about how publishers calculate their sales. Any time a cover is gender specific the publisher is effectively risking losing 50% of the potential audience. I predict with the prevalence of ebooks, it will become common for YA books to have 2 covers, a solution which isn’t cost effective in traditional print publishing. How do you balance author input with your own expertise? In other words, what do you do with a client who keeps insisting on bad cover design ideas? I’ve never had a client like that, but I have wondered what I would do if I was in that situation. On one hand, I’m employed by the author, therefore I should deliver what they want. But on the other hand if I could see what they wanted would be detrimental to their sales, then I would have to say so. I simply couldn’t do something I felt would effectively ruin the purpose of the cover. Every product has a function to serve and fundamentally, Book Covers are adverts. Can you talk about the components involved in back cover design? What does the author need to bring to the table? Book blurb, a one sentence hook, recommendations and review quotes from other authors, author bio? What about the author photo? Do you recommend one or not, and why? The more an author can bring to the back, the better. A blurb is essential. A one sentence hook is great for catching the eye and generating intrigue. Recommendations and reviews make purchasing the book easier for someone browsing, because people like to go where others have gone before — as in, it reduces the risk in their minds. And as for photos, I think they’re a good idea. Readers are naturally curious and sharing a photo will help establish a personal connection with them. I feel a photo has a psychological value similar to a signing your real name to an important document. A value that says, this is the real me, and I stand behind this book. Thanks Kura! Be sure to check out Kura’s work and website HERE. I’ve recently had an interview published for the Partners on the Path blog series orchestrated by Angelina C. Hansen. Partners on the Path features the journeys and wisdom of YA authors who aren’t yet published but are seriously “on the path” to publication. 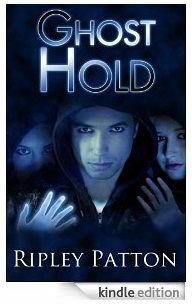 In the interview I talk a little more about the process, challenges, and joys of writing my first YA novel, Ghosthand. Ghosthand has been through the first reader phase, and is currently being edited for submission to agents and publishers. I hope you will go read the interview and leave your comments there, and here. As a part of New Zealand Spec Fic Blogging Week, Sept 13-19th, there are two new interviews with me floating about the internet. The first, conducted by my fellow 2010 SJV winner, Grant Stone, is featured on The World SF News Blog and is primarily about the flukes and foibles of creating a national writer’s association for New Zealand. The second, conducted by Karen Meade and posted on her personal blog, is more about my personal process and journey of writing. I love giving interviews because via the process of writing out answers to the questions, I always learn more about myself and what it means to be a writer. Thank you to Grant and Karen for asking such great questions, and squeezing the wisdom out of me.